DupScout Server provides the ability to quickly search duplicate files in one or more disks, directories or network shares. In the simplest case, open the DupScout client GUI application and press the 'Search' button located on the main toolbar. 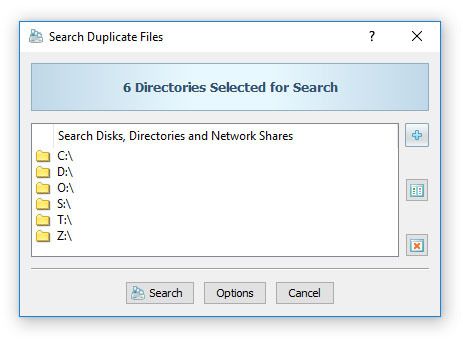 On the duplicate files search command dialog, press the 'Add' button, select the 'Add Input Directory' menu item and specify a disk, directory or network share to search duplicate files in. Alternatively, select the 'Add Multiple Directories' menu item to open a file system browse dialog allowing one to select multiple disks or directories to search in. 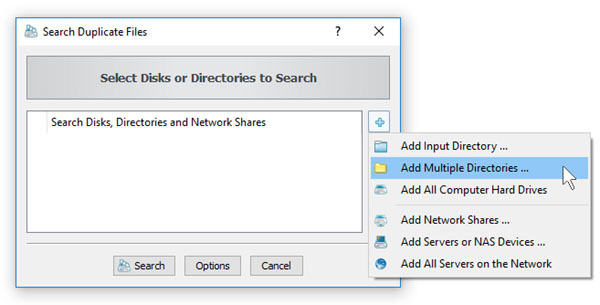 In order to search duplicate files in network shares, press the 'Add' button and select the 'Add Network Shares' menu item. The DupScout client GUI application will scan the network, detect accessible network shares and show the network shares dialog allowing one to select network shares that should be searched. Another option is no select the 'Add Servers or NAS Devices' menu item, which provides the ability to specify one or more host names or IP addresses of servers or NAS storage systems to be searched.